Karp Associates is an award-winning Fairfield County, CT building firm with over 30 years experience and an established reputation for excellence in building. Our passion for building design and creativity, attention to detail, impeccable client service and professionalism are the cornerstones of our longevity and success. Our team of professionals will listen to your objectives and deliver as outlined, on budget and on time. Renowned for our renovation and remodel of historic homes, we emphasize architectural integrity and high caliber craftsmanship in every project. A Karp custom home is born out of a collaborative approach between our client and a hand-picked team of professionals. Our experienced oversight, on-going communication and eye for detail help to deliver a home that suits your needs, reflects your way of life and is compatible with its natural surroundings. Whether building a custom home or transforming an existing one, our trusted reputation and experience in residential design and construction allow our clients to live their lives and leave the details and challenges of building to us. Fore Group, a licensed new home residential contractor, has consistently designed and built homes that have exceeded client's expectations. Offering exquisitely detailed homes, with well thought out plans, our team works with a disciplined project plan and timeline, which combined with the company's healthy financials ensure timely completion and competitive pricing. We have repeatedly demonstrated the ability to translate a complex architectural design into a stunning structure as evidenced by multiple industry awards and stellar testimonials. My name is Kevin Coyle, and I’ve been building homes for over 25 years. Not houses. Homes! A house is just a building, but a home is a personal domain. Building a home is a highly individual undertaking. I firmly believe it deserves the proper attention along the way to help ensure your home will be everything you dreamed it would be. My wife, Linda, and I started Coyle Modular Homes with this goal in mind. We offer the highest quality materials and brand names for both new construction and home rejuvenation projects. We’ll keep you informed and involved every step of the way–from design to completion. When you choose Coyle Modular Homes, you’ll work directly with me, the builder, not a salesman. I’ll advise you and be available from the design phase until the day you move in and beyond. I’ll work hard to make sure you have a completely satisfying experience. You won’t just get a house. You’ll get a top-quality home. At Domus Constructors, LLC, we are committed to maintaining the highest standards of integrity and quality through every step of the building process. We have developed long-standing relationships with proven suppliers and subcontractors, and through them we receive the best value for the products and services used in your home. We strive to be as detailed and proactive as possible in our planning, allowing schedules to be determined and maintained. We will keep you informed of upcoming milestones as well as give you plenty of notice prior to needing decisions on material selections, etc. This way, the impact on your daily routine is minimized. Throughout the project, we will partner with you to make sure you receive the best value for your money in an organized and considerate manner. It is our goal to provide a superior, quality built home that our client's will be proud of, and comfortable in, for many years to come. Throughout the project we will offer our expertise and guidance to ensure our client is well informed and confident in the quality construction of their home. We provide our client with superior construction, top-notch customer service, project timeliness and on target budget adherence. We pride ourselves in building quality relationships that outlast the project completion. Remodels or new construction, The Corbo Group specializes in a customer focused approach to home building. We are a full service design & build group offering architectural, site planning, permit approvals and construction services. Founded in 1977 by Ralph and Natalie Corbo, who decided to turn their passion for creative architectural designs into a small customer oriented company. "We strive to create homes which blend in and enhance their natural surroundings," says President Ralph Corbo. We are characterized by our unique home designs, and building what's appropriate for each home, keeping in mind the individual beauty of the site, the community, and the individual tastes and budget of the client. What makes us stand out? Over 40 years & 600 homes of experience, and our commitment to building quality homes and exceeding our clients' expectations. 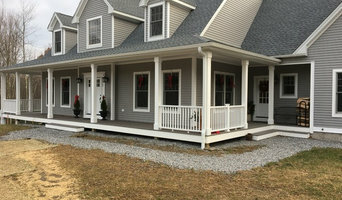 Award-winning Bear Paw Builders is a family business that operates throughout Fairfield County, CT. 30 years experience in the construction industry has cemented our reputation as a builder you can trust to complete any new home, addition or renovation to the exact specifications you desire. We offer free consultations so please do not hesitate to call or email us! (203) 227-5696 or tom@bpaw.com. 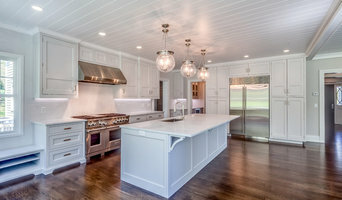 Exceptional new construction homes, renovations, and additions throughout Litchfield county, Hartford County, and along the Connecticut shore with offices in Canton and Clinton. Its' true that we build homes of all styles but we ensure that each project stays on budget and is assembled with exacting precision. All projects are also accessible to clients via our interactive online system 24/7 for convenience including live financial reporting of the project. 2016 Builder of the Year Winner! - Home Builders and Remodelers Association. DeRosa Builders, is a luxury home builder specializing in custom homes and remodeling within Fairfield County Ct. We are dedicated to consistently improving the quality of the home building and remodeling trade through innovation and communication. We aim to add value to any project through planning and transparency. On each project we deliver and employ our focused and flexible team of professionals in order to achieve the highest quality results. While our values and principles in business are timeless, we embrace new technologies and constant education to enhance our building process. We are builders, craftsman, problem-solvers and communicators. DeRosa builders aspires to raise the bar on what a builder can accomplish. Our integrity and work-ethic sets us apart. Green View Building & Design Company, Inc. Renovation Specialists, Inc. was formed in 1984 when Will Calhoun brought his training and background in design, project management, restoration, traditional and modern building skills and an interest in building science to Cornwall, CT. Will had been the staff carpenter for the Old York Historical Society, the development coordinator for Maine Post and Beam Company, and had participated in a wide variety of detailed restorations and the construction and renovation of grand homes from Martha’s Vineyard to southern Maine. He had been a boat builder, including working with Graham King building wooden racing shells. In his spare time he spent six years creating and performing with a traveling Marionette Theater. He’s been a designer and sign painter and spent several college summers as an assistant builder of kinetic sculptures with artist and architect Tim Prentice. Renovation Specialists, Inc. has engaged in a broad variety of projects ranging from small repairs to major residential and institutional constructions, renovations and restorations. Our brand is our attention to the details. We provide clear and professional communication, sound construction methods and techniques and we deliver finished products that endure by integrity and quality. We believe future maintenance requirements can and should be diminished to their lowest possible level. We adhere to basic tenets like “build to last” and “build for the next generation”. These principals are hand in glove with sustainable building and sensibility. We’ve been doing this since the company was formed. We believe we are responsible for providing legacy properties so we integrate beauty and quality into our projects. We think it’s about mastering the details throughout a project. Renovation Specialists, Inc. was re-named Green View Building & Design Company, Inc. in 2009 when Will’s wife, Alexa Venturini, whom he married in 1991, joined the company as a landscape designer and contractor after more than 20 years operating as an independent company. Alexa brings a strong design sense to her extensive knowledge of native plants, hardscape fabrication and land and site considerations together with an inspired work ethic to create beautiful and lasting gardens for her appreciative clients. Sacred Oak Homes has been building and remodeling homes and businesses throughout the Berkshires and surrounding areas for almost 30 years. In that time we have developed relationships with a robust array of skilled and local artisans, craftspeople, and suppliers. We draw on those connections and our three decades of experience to provide you with the best quality and service possible. At Sacred Oak Homes we cultivate a collaborative environment to help you realize your building goals. By engaging in clear and open communication with you, the architect, and the subcontractors, creating and maintaining an efficient project schedule, and bringing awareness and mindfulness to all our efforts, we work hard to ensure that you have a rich and rewarding experience with us. Tony Cuomo was born in Agerola, a small southern town in Italy situated on the Amalfi Coast . Tony comes from a family of craftsmen. Having grown up in an environment in which he was exposed daily to his father's woodworking skills and brother's furniture making, Tony knew, at an early age, he would head in the direction of construction and fine craftsmanship. In 1986, after a successful business run and experience in the field of construction, he moved to the United States where he founded Cuomo Construction with his wife Nancy. Like Tony always says, "quality is value" and after all, the quality of a home can only be as good as those who helped create it. Tony specialized in custom finish work and wood detailing such as crown, cornices and frieze molding. His meticulous detailing with trimming and interior finish work, combined with a true love of his craft brought him notoriety in his field. The next logical step was to bring the company up to the next level, and the first "Cuomo Home" was built in 1989. Cuomo Construction operates on the basis of integrity and honesty as its primary business principles. We believe in dealing fairly with our customers, our employees, our subcontractors, and our suppliers. We pride ourselves for maintaining strong bonds and longstanding relationships with our quality trades-people, many of whom have worked with us for twenty years. Like Tony always says, "quality is value" and after all, the quality of a home can only be as good as those who helped create it. Cuomo Construction, Inc. has built over 200 homes throughout Middlesex County and New Haven County in Connecticut . We will use our experience to guide you in every step of the home building process, from groundbreaking to landscaping. We sincerely appreciate your interest in Cuomo Construction, Inc.
Supreme Industries Building Division has experience building custom homes, barns and sheds of all different styles and sizes. Based in Burlington, CT we offer services in (but not limited to) Litchfield and Hartford counties in CT. We work with Hinman Lumber to be able to create custom home designs for a variety of building projects including timber frame structures and homes. For New Milford residential home builders who also act as developers, the job starts well before the first nail is driven. They perform local market research to determine whether the prospective homesites make sense in the New Milford, CT market, as well as survey the land on which the house will be built to make sure it is suitable for construction. Custom builders also obtain the necessary permits. A good custom home builder in New Milford, CT has skills that go far beyond construction — he or she must supervise subcontractors and artisans; keep tabs on local zoning regulations, building codes and other legalities; inspect work for problems along the way; and perform dozens of other roles that are essential in building a quality house. Here are some related professionals and vendors to complement the work of home builders: Interior Designers & Decorators, Landscape Architects & Landscape Designers, Architects & Building Designers, Kitchen & Bath Designers, Specialty Contractors. House builders are responsible for ensuring that the home-building project sticks as closely as possible to the specified timetable, particularly in the event of change orders. Custom and luxury home builders in New Milford, CT also need interpersonal skills to deal with clients of all types, soothe frazzled nerves, negotiate conflicts and resolve problems. Find custom home builders in New Milford, CT on Houzz. Narrow your search in the Professionals section of the website to New Milford, CT home builders. You can also look through New Milford, CT photos to find a house you like, then contact the builder who worked on it.